Barbro Andersen: Introducing iiS of Norway! I'd like to start by introducing the brand itself; then show my interpretation of items within the collections in separate posts. This way I am completely open about the sponsorship, and there are no doubts regarding the issues of "hidden promotions" and such. I always share my honest opinions, even if the outcome unflattering. Questions? Just contact me here. Nordic by nature. It sounds like the title of my biography, doesn't it? 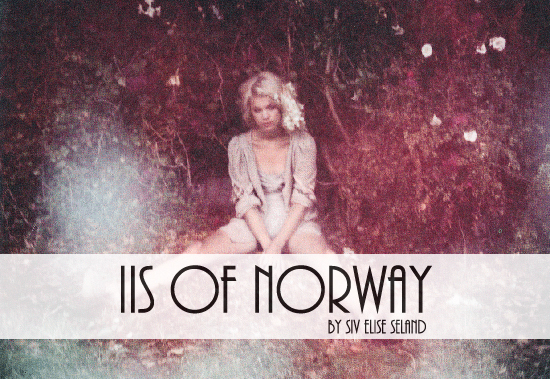 iiS by Siv Elise Seland is a fashion brand run by a small family business located on the windy south west coast of Norway. You've seen her designs on my blog before; both from Oslo Fashion Week and in separate inspirational posts; (i.e this one, this one, this one and this one). For me, iiS is one of the best there is here in Norway, and I am truly honored she finds my blog worthy her designs. It will not come as a shock when I declare my love for this brand, will it? The essence of the iiS lies in the Nordic light and endless summer nights; while struggling with the Norwegian melancholy in the darkness of winter . The designer, Siv Elise, was offered a stage at Versace, but chose to go back to Norway to start working on her own brand together with her mother, Olaug Seland. So the story begins. iiS was launched the summer of 2006 and is a very eco friendly brand. They use recycled wool and ecological cotton produced in local workshops in Morocco. After having success with the first collection based on retro glam knitwear inspired by traditional Norwegian sweaters, iiS has developed throughout the seasons, and is now exported to several countries, among them Japan, Holland, Denmark, USA, Finland, Ireland, Switzerland and Italy. You can read about Siv Elises inspirations and motivations in an interesting interview with Invaerk here, and find out more on the website: Iis of Norway or Facebook.